Photo courtesy of Pest Control Bucks. Considered one of the worst pests in the lawn and garden, moles destroy beds, roots, grass while eating their body weight in insects and worms daily. International horticulturist Mike Alexander shares his experience dealing with the destructive creatures. In every country that I have worked as a gardener, one question has repeatedly come up sooner or later. What do you do about moles? The embarrassing truth of the matter is that I have never had any success at getting rid of these fury little pests. 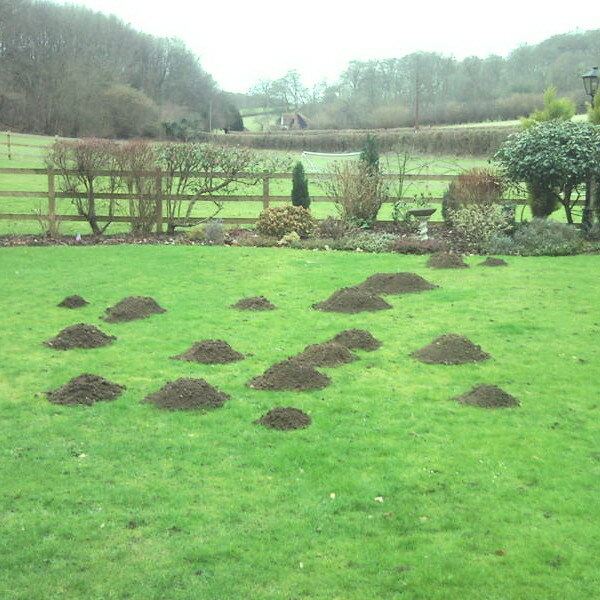 I have heard dozens of different wives tales but my personal success dealing with moles has been woefully poor. Anecdotal remedies run from pumping car exhaust fumes into the burrows to explosive detonators. Moth balls were a favorite at one stage, followed by little plastic windmills, which were supposed to drive the moles into a state of such anxiety with their vibrations that they simply packed their little bags and left. Well, none of these quick fix remedies ever came close to raising my success rate. I did have a dog who was extraordinarily adept at mole catching. She would sneak up to a mole hill on the equivalent of doggy tip toes and then just sit down and stare at that mound of earth until there was movement at which stage there was a quick pounce, a small explosion of flying dirt and one less mole to worry about. My current dog, Miss P, while a wonderful dog in most respects, shows absolutely no interest in getting involved in this sort of dirty work. At one point, I did try digging around a mole hole and simulating high excitement in the hope that she would become enthused at the possibility of some sport. She simply looked at me with that bored, glassy-eyed expression my wife gives whenever I try to explain to her some of the finer points of rugby. Being a pathetic mole catcher myself, I can’t really blame my dog for not taking to the hunt. Fortunately there is help at hand in France. There are people in this country known as “taupiers” and their trade in life is to ride from farm to farm hunting moles for head money. The man in our neighborhood charged with this responsibility is a little wise old man who arrives in the quintessential lopsided Citroen van crammed with bright little miniature flags and other paraphernalia associated with his trade. After wandering from mole heap to mole heap for a few minutes, he digs in the back of the van and produces some rusty old traps and an equally rusty kitchen knife. He sets his traps which he then marks with the flags and with a grunt and a nod he disappears for several days. When he returns he digs up the traps and sure enough each time he produces some dead moles, which he brings me in order to claim his pay. I always inspect these very carefully to ensure he is not running a racket with mole corpses that he has popped into the microwave to defrost before leaving for work in the morning. After each of his visits I won’t normally have a mole problem again for the remainder of the year. Although this is quite a ruthless method of solving this problem, it is the only one I have ever found to be successful. I am sometimes asked if there is not a humane trap with which we can capture the pests alive. In fact, such a trap does exist but my taupier does not offer this solution and just laughed when I asked about it. When you consider it, if you did capture a mole in a so-called humane trap, what would you then do with him? You can hardly release him in a neighbors yard, a nearby farmer’s field or at the local golf course. And set free at the far end of your property and you will only see him back again in a matter of days. Perhaps someone could create a nature reserve where displaced captives could be relocated, a sort of Maasai Mara for moles, only smaller and with hole ridden plains that look a little like Gruyere cheese. This entry was posted in Garden Pests, Uncategorized and tagged garden, garden moles, garden pests, gardening, lawn moles, moles, moles gardening, moles pests, moles rodents, pests. Bookmark the permalink. Did you take that photo in MY garden? The lawn in my garden was looking likes the one in the photo – but now – at least for the moment – it´s all under control. Moles have been the bane of my life .. though have tracked down the odd “mole-man” from time to time in England and tried everything else too … Really hate to kill such beautiful creatures but they do make an awful mess for their size! Mike may be a horticulturist, but the humour in his writing surely ‘outdigs’ all other skills. Thanks for the good read!! It reminded me of a similar pest situation: while working at the Conservatory Gardens in Central Park- NYC a number of years ago the main, central lawn area some roughly 70 yards x 30 yards was re-sodded. Every single morning for 6 weeks we came into work to find half-a-dozen sections of sod rolled back at the seams…turned out to be raccoons in search of grubs in the soil. Every morning we would roll back and tamp the seams, until finally they took root and began to grow. Thanks for visiting. Ridding existing lawns of gophers can be tough, to say the least. We’ve heard of people using methods ranging from flooding holes (with a garden hose) to fumigation (with toxic poisons), with varying levels of success. Most experts recommend using traps. Before seeding new lawns, laying down sod or planting flower bulbs in gopher-prone areas, it’s a good idea to install heavy-duty wire mesh underground and around plantings as a deterrent.